Bringing a revolution in kitchens are the Combi ovens that are designed to perform three functions. That is, convection, steam and a combination of the two. The technology used to achieve three functions is however rarely gotten right by many manufacturers due to its complicity. This is where Unox Combi ovens stand out. 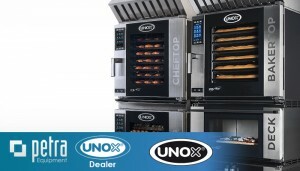 Unox Combi ovens are ovens manufactured by the Italian manufacturers, Unox. The ovens are unique in the sense that they are able to blend perfectly the science of a convection oven and a steam oven to give you perfect cooking and basic results. On the steaming side, the oven is designed to produce steam from 120 degrees. This thus gives full proofing application for pastries such as bread and cakes. This makes it unique to the ordinary steam ovens that are 212 degrees and a 100steam all the time. With a Unox Combi oven you can introduce anything between 10- 100% steam and any temperature, not necessarily 212 degrees. This clearly gives you a wide range of temperatures to choose from. This enables slow cook. Slow cook is a favorite cooking methods for top chefs because it not only enhances flavor but also can actually improve nutrient content. Slow cook is also enabled by the precise control the ovens afford of both the temperatures and humidity. The ovens come with two steam options that is, the Steam Maxi and Seam Plus. The steam maxi technology oven will start producing steam immediately at 35 degrees while the steam plus will produce at 48 degrees. For roasting purposes, the ovens come with the technology of Dry. Maxi and Dry. Plus that are designed to rapidly remove any excess humidity. This provides the ideal roasting condition to get a tasty and tender toast. Excess humidity in the cooking chamber is the primary cause why you get reduced and weight loss to your roast. Dry Maxi technology is particularly essential when baking sponge cakes. The technology allows you to bake soft but compact structure at the same time. When it comes to Baking bread and bread oven products, the ovens are designed with Air Plus and Air Maxi technologies to give you golden and fragrant results. It’s even better when doing frozen bread because ventilation in the cooking chamber can be easily controlled. Using the Unox Combi oven is quite easy. All you have to do is press the buttons to set the time to your desired stop with the + or – buttons. If you desire to set the time to infinity, the oven gives you that option button too. Next selection is temperature level done through the buttons too. Lastly, select whether you wish to have moisture in your oven or you want a dry oven. Once satisfied with the selection, press the start button. At Petra Equipment, we stock 16 various kinds of Unox Combi Oven to suit large and small volume restaurants, cafe.Our prices are quite friendly because we have slashed the prices for you by $1000! Further, we stock the Unox CHEFTOP MIND.Maps™ ONE XEVC-0711-E1R Combi oven that blends class with your various oven needs. The oven is ideal for roasting, grilling, steaming and baking bread. Some of the best features of this machine is that it has high performance thermal insulation, high durability carbon fiber door locks and even LCD touch screen, specific fan to reduce baking time among other incredible features. Controlling fan speed is essential for maximum flavor and perfect result of moorkop and all choux pastry. Available in stock at Petra Equipment is the Unox CHEFTOP MIND.Maps™ PLUS XEVC-0621-EPR Combi Oven 6GN 2/1 with a voltage of 400 V ~ 3N thus very energy efficient. Just like the above oven, it is ideal or roast, grill, steam and baking. For all your baking and pastry purpose, the Unox BAKERTOP https://www.petraequipment.com.au/bakery/bakertop-unox-oven-prover MIND.Maps™ Baking Combi Oven XEBC 16EU EPR /GPR/ E1R has you covered. Its features include offering Manual baking modes + advanced and automatic baking programming, capacity to store up to 256 user’s programs and triple internal glass. You might be interested in reading our article on Rational Combi Ovens.